The Goon Sax are pretty special. The Australian trio hail from Brisbane, and their thin, wiry, poetic sound ranks alongside Galaxie 500, The Velvet Underground’s twilight third record, or The Go Betweens. Too young to know any better, the teen sensations have stumbled onto fresh ground, with their lo-fi take enforcing a real sense of originality. In many ways Sweaty Hands is classic The Goon Sax, effortlessly inviting the listener into the world of teenage romance with all its awkwardness, boredom and self-doubt. Sweaty Hands is one of the albums finest moments, from the primal drum beat to the rolling bass lines its melodic simplicity shines, as Louis’ lyrics take us on a tour of his neighbourhood, his mind constantly drifting back to an un-introduced, “you”. His ability to make the most everyday situation sound like some grand romantic quandary is un-flashily stunning, “I think about you in the elevator alone, and all the things I won’t say when I get home”. New album ‘Up To Anything’ is a pastoral, hazy, thrill of a record, with The Goon Sax set to follow this with a substantial UK tour. The Goon Sax, the Brisbane three-piece we first mentioned somewhile ago now, are heading to the UK for their first UK tour. Following the release of their debut album ‘Up To Anything’ in April, the teens – Louis Forster, James Harrison and Riley Jones, all 17-18 years old – they make their first appearance in the UK on September 27th at London’s Shacklewell Arms. See all other dates below. They also shared the new retro video for recent single and album title track, ‘Up To Anything’. 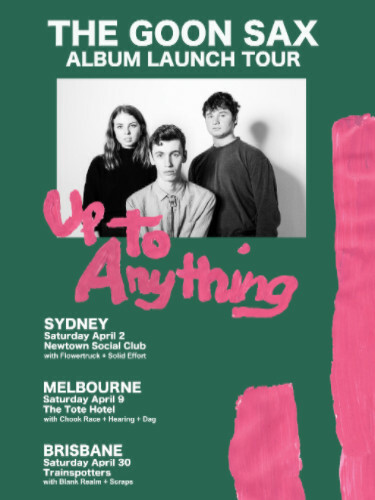 This Saturday, terrific teen trio The Goon Sax kick off their Up To Anything album launch tour in sunny Sydney. The album has been getting hot press all over the world, including rave reviews in Mojo,Pitchfork, Uncut and Rolling Stone!, Chapter Music is excited to announce a new tour in the form of Brisbane teenagers Louis Forster, Riley Jones and James Harrison, aka The Goon Sax. The Goon Sax make pop music. They love the Pastels, Talking Heads, Galaxie 500, the Apartments, Woody Guthrie and Prince. The band formed at high school in 2013 when James and Louis began workshopping song ideas in James’ bedroom. Riley joined in March 2014, after a month of drum lessons, and the band played their first show a few months later. They’ve since played with the likes of Twerps, Blank Realm, Darren Hanlon and others. 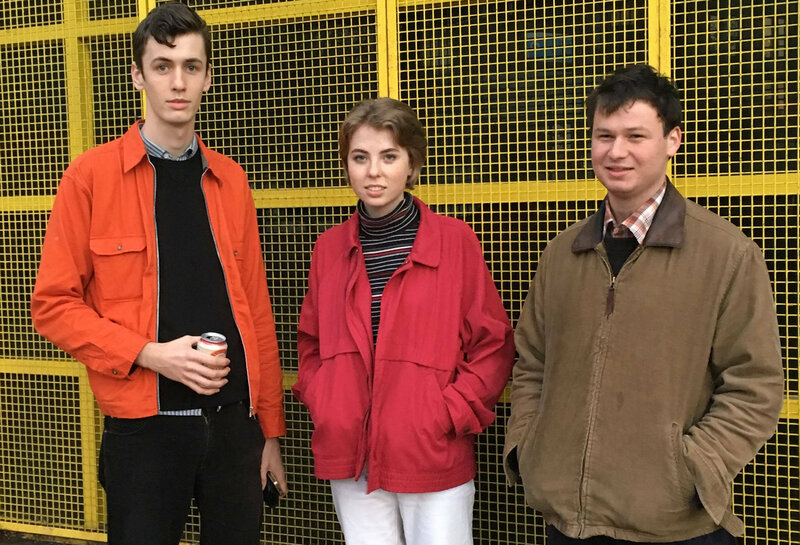 Ludicrously talented teenage trio The Goon Sax had already grabbed our attention with barnstorming singles Boyfriend and Sometimes Accidentally, and featured in our ones to watch in 2016. This week to much excitement around these parts, they have confirmed details of their upcoming debut album, Up To Anything which will be released on Chapter Music next month. They’ve also this week shared the albums title track, yet more evidence for the theory that they’re probably the most exciting Indie-Pop band on the planet. Here The Goon Sax are blending the glorious lo-fi melancholy of Galaxie 500 with the poppier moments of The Vaselines or Teenage Fanclub. As ever the lyrics tumble out as a stream of consciousness, painting vivid pictures of the mundane and sometimes lugubrious process of growing up, and wanting to be someone, singer Louis Foster noting, “I only do these things, so I can tell you about doing them”. Thrilling stuff, The Goon Sax take us back to memories of our teenage years, even though they’re still living through theirs, roll on the album. 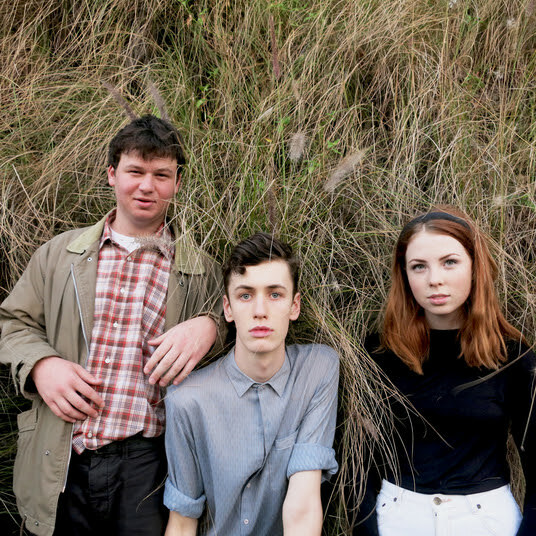 Fresh faced Brisbane trio The Goon Sax are a band who’s influences seem almost too old for their years. They may still be in their teenage years but they cite the likes of The Pastels, Galaxie 500 and Talking Heads as influences, and make the sort of music last heard being pedalled by Postcard Records at least a decade before any of these three were even born. Whilst we’ll have to wait for their debut album, they’ve already shared two tantalising snapshots of what to expect in the shape of singles Boyfriend and Sometimes Accidentally. Boyfriend is a plea for, “a boyfriend or just anything real”, set to a fizzing-stab of drums and guitar; whilst Sometimes Accidentally is a glorious slice of downbeat jangle-pop. Music for your heartbroken inner teenager hasn’t sounded this fresh or exciting in a very long time. first single from The Goon Sax debut album Up To Anything, to be released by Chapter Music in 2016.